Avengers: Infinity War took the storytelling trope "kill your darlings" to a whole new level, dishing out little mercy in its heartbreaking ending that saw big-name heroes bite the dust — literally. While some characters' fates were seemingly sealed, others were left up for interpretation, namely the handful that didn't appear in the oversized blockbuster but definitely should have: Valkyrie and the Asgardians. Now, just a few days post-release, Avengers: Infinity War director Joe Russo has revealed what happened to Tessa Thomspon's hard-drinking Valkyrie and the rest of the Asgardian refugees. For a refresher, Avengers: Infinity War picks up where Thor: Ragnarok left off, with the tense scene aboard the Grandmaster's (Jeff Goldblum) refugee vessel that carried Thor (Chris Hemsworth), Loki (Tom Hiddleston), Hulk (Mark Ruffalo), Heimdall (Idris Elba), Valkyrie, and the rest of the rescued citizens of Asgard. Thanos (Josh Brolin) and his band of vicious "children" known as the Black Order battered Thor in an attempt to extract the Space Stone from the Tesseract, then stabbed Heimdall through the chest, intercepted Hulk (whom Heimdall sent to Earth using the Bifröst before dying), and murdered Loki. Infinity War then carried on directly after Loki took his last breath, not bothering to address Valkyrie and the remaining Asgardians. During a Q&A at his old high school in Iowa City, director Russo confirmed that Valkyrie survived Thanos' surprise attack. A student who attended Russo's presentation took to Reddit to relay the information. "He did confirm that Valkyrie lived," the user wrote. Russo didn't reveal exactly how the heroine made it out alive, but given that he mentioned a portion of the Asgardians on the ship had fled using "escape pods," it's assumed that Valkyrie may have done the same. 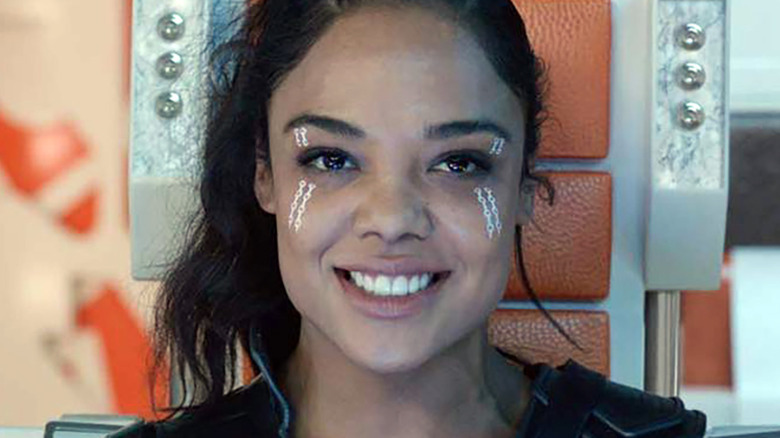 Though ducking away from a major battle doesn't quite seem like something Valkyrie would do (let's not forget her ready-to-rumble attitude in Thor: Ragnarok), perhaps she was tasked with ensuring the last Asgardians evacuated safely. After all, they're simple civilians and she's, well, a former member of the legion of warriors known as the Valkyries, of course. Sadly, those wondering what happened to Korg, the adorable Kronan warrior voiced by Thor: Ragnarok director Taika Waititi, won't be as pleased with Russo's remarks. The same Reddit user indicated that they asked Russo whether Korg survived the ambush, but the filmmaker answered that he wasn't "willing to say what his fate was," at least not at this time. So there you have it, Marvel fans: A bunch of our precious heroes may be gone for good, but Valkyrie is definitely still alive. Silver linings, right?